Since today is the final Dainty Sprinkles post for 2013, It seemed only right that I did some kind of annual roundup post even though I don’t really enjoy celebrating the New Year ! The style of this post i.e month by month, etc. is inspired by Tolly Dolly Posh’s 2013 post – Just saying incase it looks as if I copied, Oops. For me, 2013 wasn’t rather interesting or hectic compared to previous years such as 2012. In terms of blogging, My blog has definitely grown and I’ve also began making YouTube videos – Both I am very proud of. I’ve also gotten to know lots of amazing bloggers on Twitter – Especially through the #tbloggers chats. It’s crazy since one or two of the bloggers I’d often be chatting to, I’ve been obsessed with their blogs for ages so when I first chatted to them I kind of fangirled ! WARNING I SOUND SO SOPPY NOW ALERT ALERT OH SUGAR ! Everyone in my family were in good health throughout 2013 which is more important than anything else and they still manage to put up with me which they deserve a thousand medals for because I can hardly put up with myself ! I’m so thankful to have a supportive family even though I don't always get along with them and I'm generally a pain in the a*se they support me through everything ! Not only that I also have the maddest of friends at school who I’ve gotten to know loads of other people through. On a personal note, I feel that the fun fun fun oul’ social anxiety or anxiety in general has slightly began to improve over the past few months although I still manage to turn up at art class panicking for a whole forty minutes because I didn’t have a large folder and then I lost my picture and I still don’t know how to use the printer and everyone’s talking and I’m just sitting there awkwardly like “lol definitely going to get that A in the JC. No not really.” Or worse still is when I always reply to people having conversations in my head except then SOMETIMES I SAY IT OUTLOUD BY ACCIDENT LIKE WHYY ! Sarcastic mumble of “Why aren’t you a lovely person” anyone ? Ok lets not begin talking about awkward school situations ! Happy New Year, Happy New Month, Happy New Day, Happy New Hour, Happy New Moment ! May the odds be in your favour although between you and me a little bird told me that it’s going to be an awful year. Jokes. It will be wonderful. I hope. I spent all yesterday evening making the month name e.g January edits and then putting all the photos in collages which is why this post is quite late so I hope you's enjoy and thanks so much for reading Dainty Sprinkles ! Lets begin the post with a celebratory llama dance ! 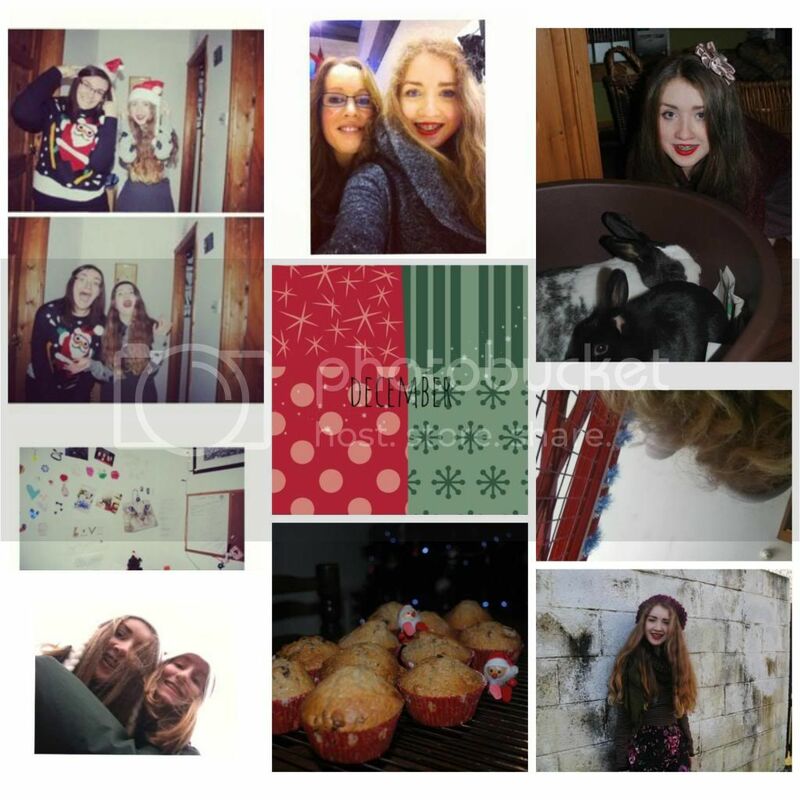 January was a great start to 2013 and strangely enough, I can say that I honestly love every blogpost I posted that month. 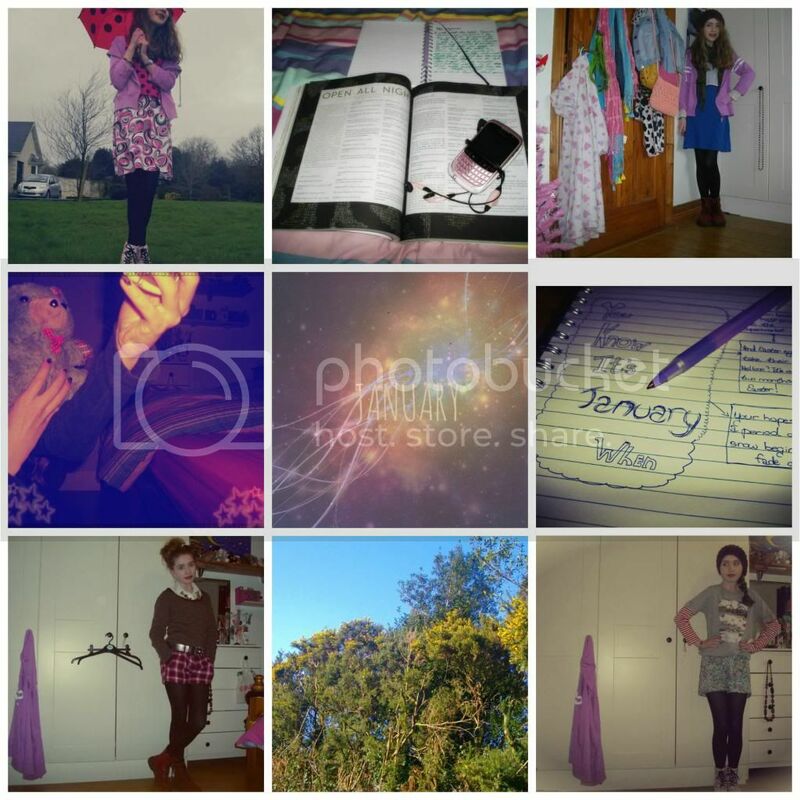 I discovered photo editing and played around with different effects which were the making of posts such as January Junk and The Nighttime Distractions which are two of my favourite posts I've ever done because they were so fun to both photograph and write. They were inspired by the mysterious photoshoots in Rookie Yearbook One and the theme of January 2012 'Up All Night'. I loved all of my outfit posts in January especially Rarely Seen In Pink and Burgundy and Gold since they were all very full on in terms of patterns and textures. I began wearing more shorts which is something I hadn't really worn before but I discovered that they could be paired up with so many different pieces of clothing. 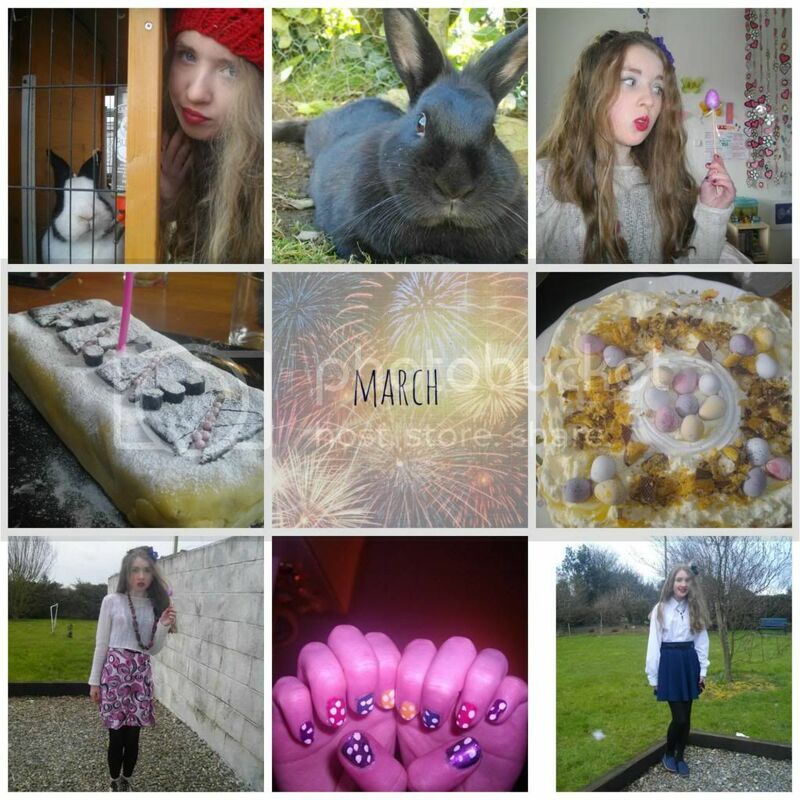 February was another fun month in terms of blogging. I posted less photography replacing it with makeup tutorials ! I was desperate to begin YouTube videos but I wasn't allowed yet so my tutorials were in written form. I did a Decades Inspired Outfits of the Week featuring every decade from the 1960's right up the the 2000's ! The makeup tutorials I did where inspired by the decades too and were posted once a week during February. It also began to lightly snow during February making the weather extremely cold ! February wasn't a great month for me as anxiety crept up on me creating all sorts of havoc such as meltdowns and the works which pretty much ruined family occasions. During March there seemed to be photographs of cakes all over Dainty Sprinkles because it was both my birthday and Easter - It was also my brother's birthday too but I don't think I put up a photo of the cake. It was so cold, Light snow fell again and it snowed on the day of my birthday ! 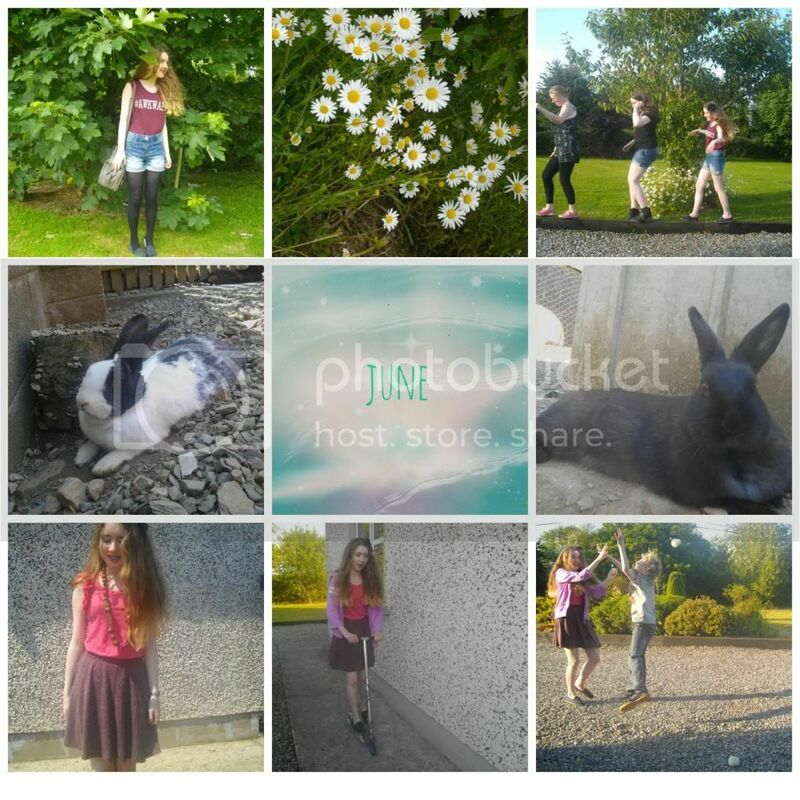 I also did an Easter collab post with Kate//Jane//Gaby and I took some of my favourite photographs of Plum and Truffle yet. 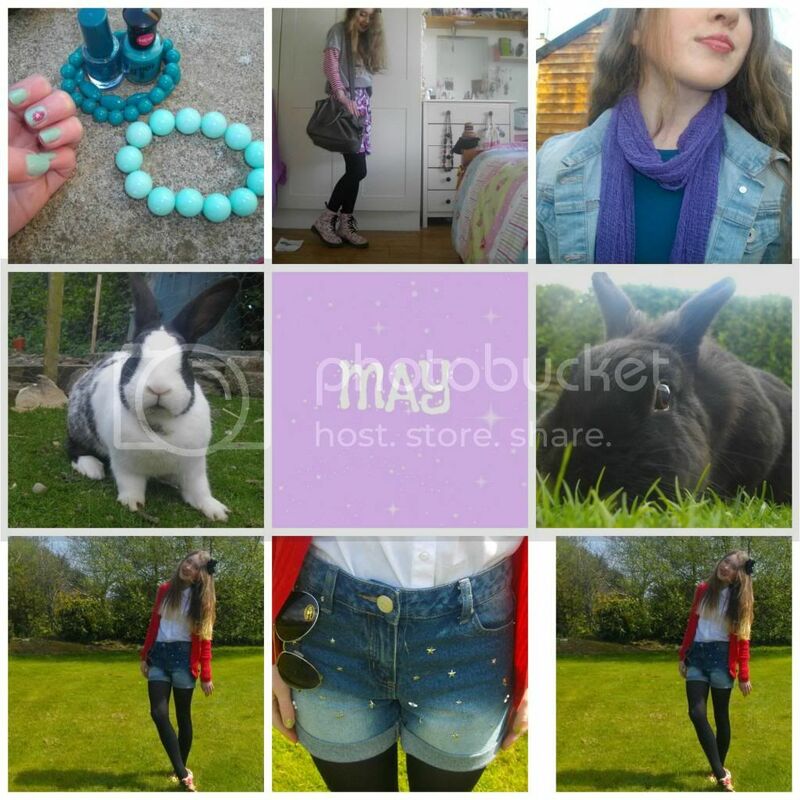 My favourite outfits I wore that month was the Easter inspiration outfit because of the sweets and springtime the pastel colours resembled and the outfit I wore on my birthday because I loved the simplicity of the blouse with the navy skirt and the black necklace. Both outfits reminded me of storybooks such as Alice in Wonderland and clothes I wore when I was younger. I also created an Instagram account which opened a whole new can of worms. Dainty Sprinkles' first birthday was on the second day of April and in celebration, Not only did I do a celebratory llama dance but I began a YouTube channel ! I filmed on my iPod and to be quite honest my videos were cringey and awful. I finally had a tripod (thank you Nanny !) so taking outfit photos were far more easier. I also got the ends of my hair dyed ombré which was pretty much the best thing ever and I can't wait to get it redone in 2014 since my hair has grown alot since then. 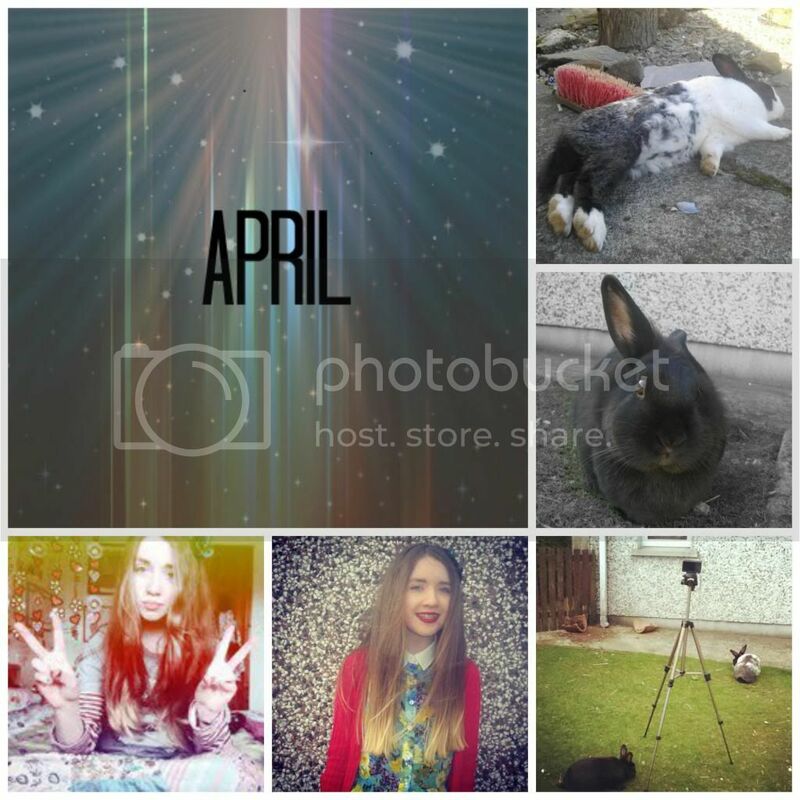 Something I forgot to say about March was that on the day I created my Instagram I linked it to my Facebook (personal account not blog one.) by accident meaning that until I removed the app on Facebook, All of my Facebook friends who also had an Instagram linked found my Instagram which was meant for my blog and everytime someone from school liked a photo of mine more people followed meaning that alot of my year know about my blog & YouTube. This used to make me panic the whole time in school because I know that not everyone's going to have a positive opinion on it but it doesn't bother me anymore - I'm doing a blogpost about this in 2014 ! Teen Vogue used to do a feature on their website called "Reader Beauty Look of the Day" so I sent in a photo of my ombré hair and the makeup I wore and then about two weeks later I got the hugest fright when I went on teenvogue.com found what I'd sent in as Reader Beauty Look of the Day ! I was literally like "OMIGOD OMIGOD OMIGOD" and I even put a screenshot of it on my Facebook page which was a big step because it had my blog name in it but quite frankly I was so excited and shocked I didn't even stop to worry about it ! My favourite outfit I wore during May was a very preppy outfit consisting of a red cardigan and blouse with denim shorts & wacky brogues it was different to what I'd usually pair blouses with and it was the perfect weather for shorts ! 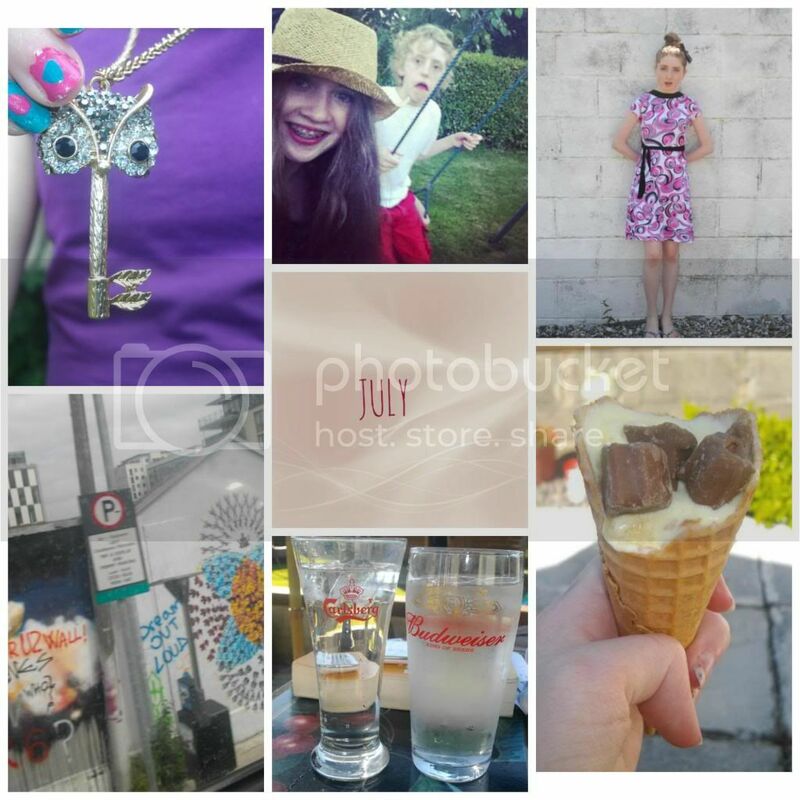 At the beginning of June, I went to Westport, Mayo on a family holiday and I never got around to doing a holiday diary style post but you can see some photos of the holiday on my Instagram. We were lucky enough to experience a heatwave whilst on holiday and it was roasting day and night. I also asked you all if you'd like to see a series explaining Dyspraxia, Anxiety, etc. and you did ! 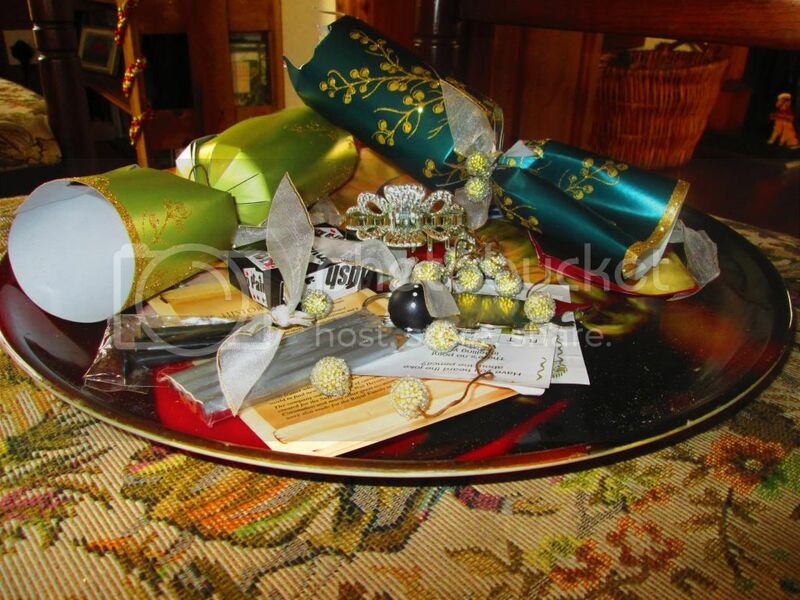 The four blogposts were very difficult to write but the response was amazing. I'm hoping to do more "Missing Pieces" posts in the future one I'll hopefully be posting over the weekend. My eyeliner went very heavy and my makeup looked dreadful so lets just close a door on that ! The Missing Pieces // Whitewash // Do we take it too far, Take it too far? Did we chase the rabbit into wonderland ? In July, Ireland was sent yet another heatwave which lasted the entire month ! It was absolutely crazy, The temperatures reached thirty degrees Celsius and it didn't rain at all which is abnormal like this is Ireland, It doesn't happen, Our summers are generally cold and full of rain ! The weather was amazing and I spent most of the month outdoors on the swings and we ate dinner outside for the entire month ! Because of the beautiful weather, I had the opportunity to finally wear a ton of summer clothes and I honestly cannot pick a favourite outfit from this particular month although I particularly love "Whitewash" which is inspired by 60's mod makeup and fashion. Dainty Sprinkles reached a milestone of 150 GFC followers The heatwave of July 2013 is definitely a month every Irish person will remember in years to come ! August was yet another brilliant month in terms of weather although it did cool down very slightly. The August bank holiday weekend festival took place where I live and I had great fun at the amusements with my friends Aveen & Vivien - We took selfies eating junk food. I was over the moon yet again when Dainty Sprinkles made the longlist of four categories in the Blog Awards Ireland ! I loved all the outfits I wore during August but my favourites would have to be "I'll be flicking stones at your window I'll be waiting outside 'til you're ready to go" which is the most popular outfit post on Dainty Sprinkles & Born in the Wrong Decade a 1920's inspired outfit. These two outfits contrast eachother since one is quite simple but the other is full of patterns. Gaby created #tbloggers chat on Twitter and asked Jane, Tolly and myself to host some of the chats and I created the Twitter icon, etc. on PicMonkey. I love #tbloggers as I've got to know so many fellow teen bloggers through it and it's something I look forward to each week. During August, I was in a local summer play that took place twice a week for the duration of the month and the day it finished, I also returned to school beginning Third Year which was daunting but it was great to see all my friends again. 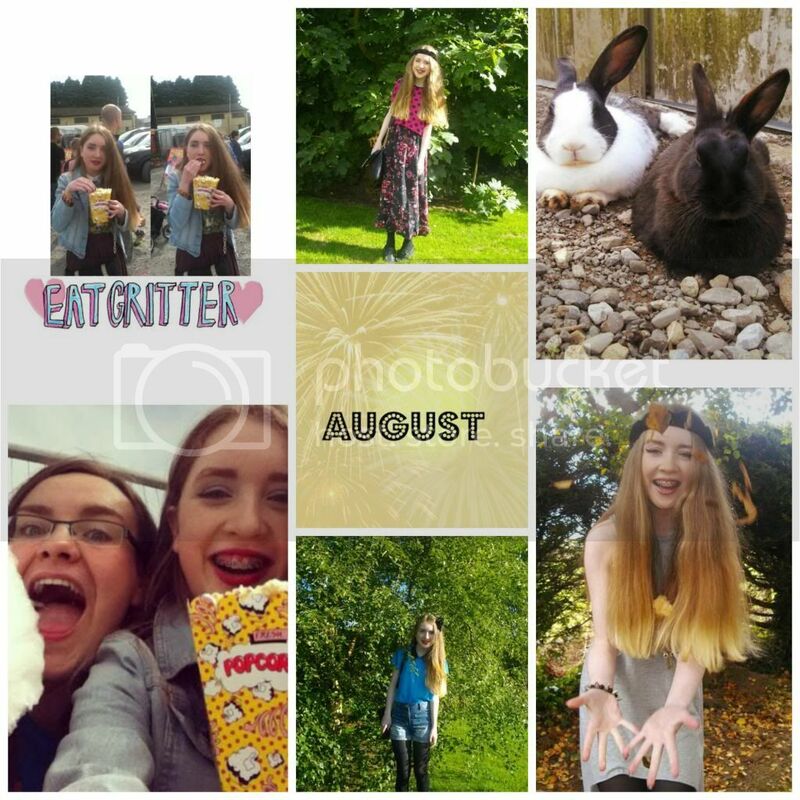 September wasn't very interesting here on Dainty Sprinkles since I was back at school and was too lazy to do anything at weekends but I did see the One Direction film twice which was pretty much the best film ever pardon the pun even though I'm not really a Directioner or anything. Dainty Sprinkles made the Blog Awards Ireland shortlist in the category "Best Youth Blog" I was so delighted and thankful ! 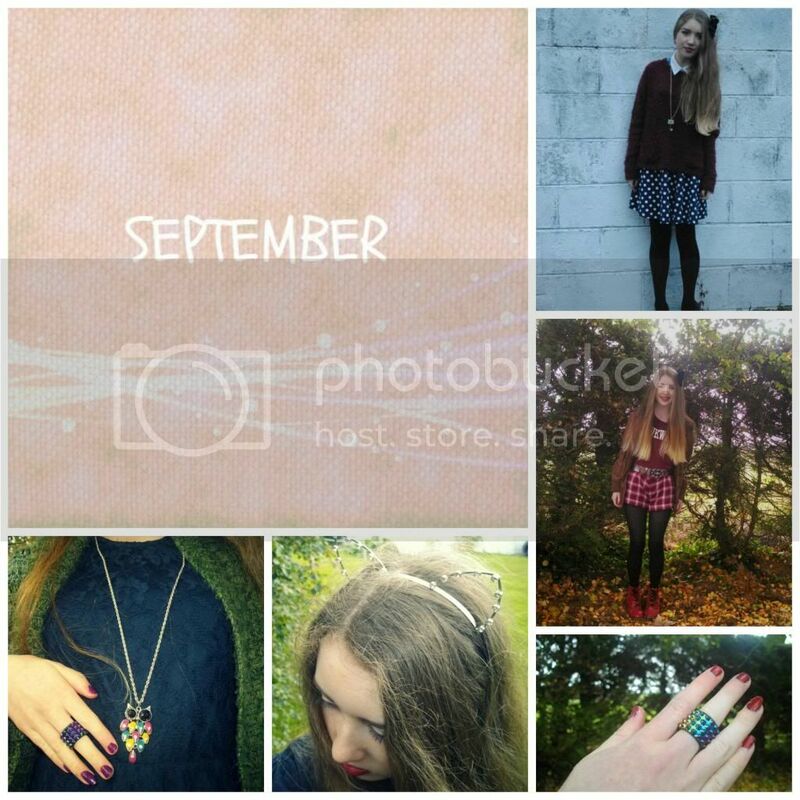 It wasn't very cold in September so I took advantage and made the most of the kind weather when choosing outfits ! My favourite outfit post of September was "In between the lines Is the only place you'll find What you're missing But you didn't know was there" as I loved how the burgundy colours looked against my straight ombré hair, The outfit was quite different to what I'd usually wear. 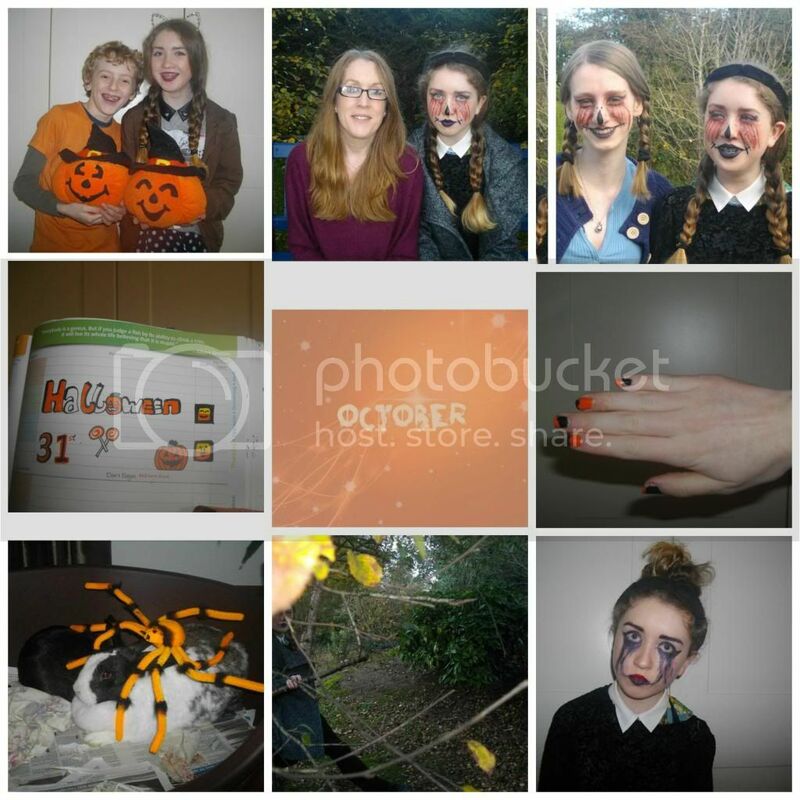 October was one of my favourite months - If not my actual favourite month of the year ! I got into the spirit of Halloween, Filming lots of makeup tutorials for my YouTube channel which I've since been using for my Art project for the Junior Cert. Aveen and I filmed our first Awkward Sprinkles video and drank cola out of Starbucks mugs because we're fabulous. No, Not really. Another collab I did was scary alternative Disney princess tutorials with Gaby, Jane & Kate. I did a vampire Snow White and it turned out exactly as I'd hoped for. I also did a makeup tutorial inspired by Lorde's 'Tennis Court' music video and took tons of photos surrounding Halloween decorations and sunsets. On the day of Halloween I went into town with my friends Aisling and Vivien and I did Aisling's makeup - We both went as some kind of vampire zombie and received lots of odd looks whilst walking down the main street. 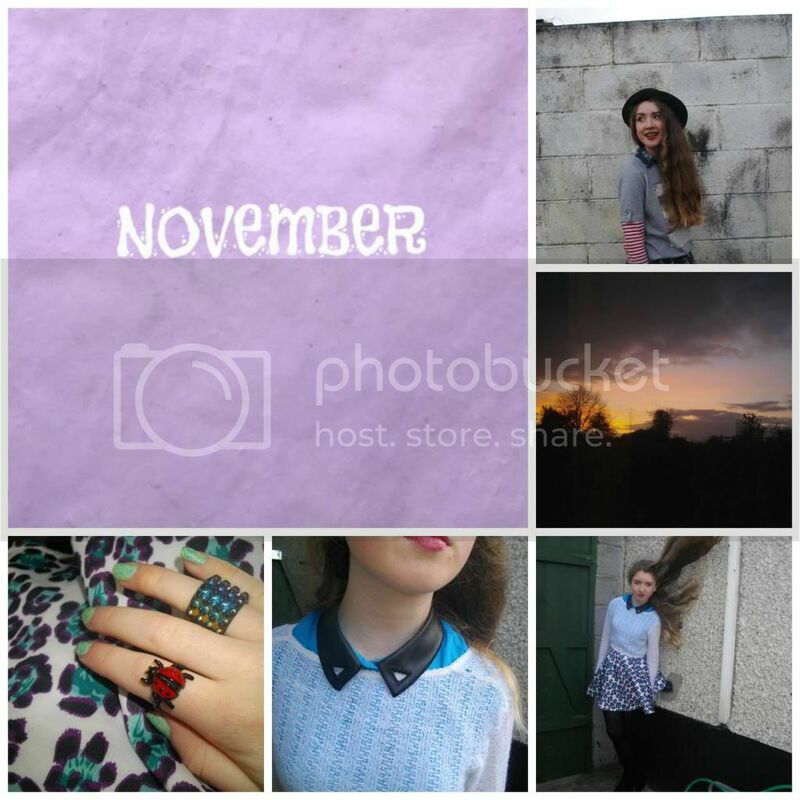 November was a bit of a boring month which resulted in taking two days off in one week - One was designated like the whole school were off for the parent teacher meetings and the other was on the Friday to go to Crumlin because I got an appointment for my scoliosis and it turned out that my spine had a curve of 39 degrees meaning I had to do daily exercises which I've been trying my best to do - I began doing them properly on Sunday. 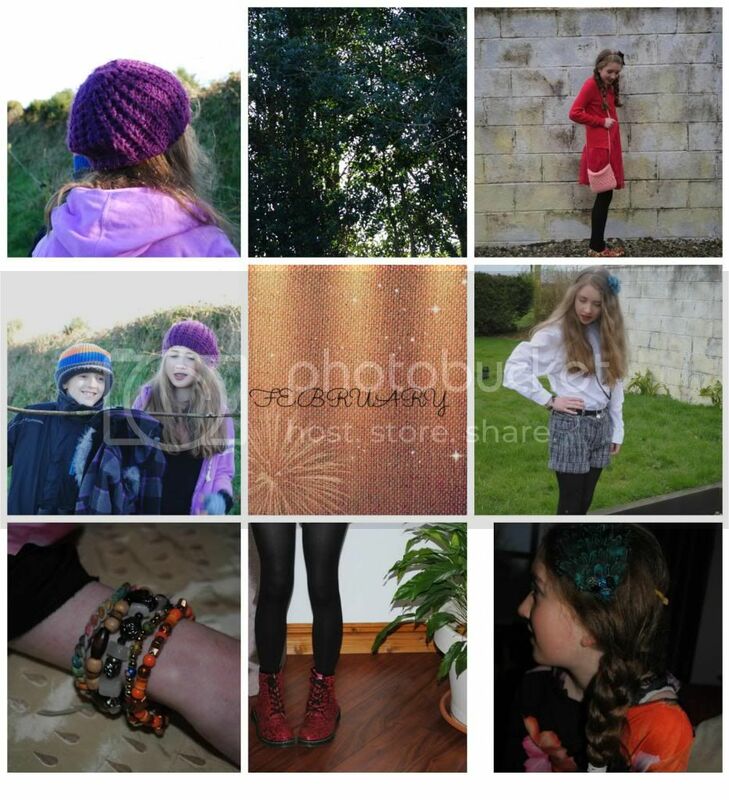 My favourite outfit post of November was "Got a little soul The world is a cold cold place to be". I loved the cold colours of purple blue and white plus the wind made my hair appear crazy ! I also love the rings I wore - They're my favourites ! December is of course the most recent month to document and it hasn't been a bad month. We had our Christmas Exams the first week of the month so I wasn't under alot of pressure the rest of the month but I had alot of work to do in subjects such as Art. Aveen and I filmed another AwkwardSprinkles video - This time a Christmas themed ramble and Aveen managed to photobomb at least half of the Christmas decoration photos I took ! I participated in Jane's #ChristmasBloggers series which was a lot fun since I had an excuse to take lots of Christmas-sy photos. Since my camera broke, I used my mam's big camera for the month of December which was the best thing ever and now I miss not having to worry about photos messing up because of my shaky hands ! We also had a nonuniform day in school which nobody expected ! The last week of school was brilliant not only because my friends & I did Kris Kindle but I put up tinsel on Area Four stairs where we sit by every day at lunch which particularly mortified my friends Chyan, Emma and Mary and then Aisling, Vivien and I wore santa hats ! On the weekend of Christmas, My family and I went out for dinner and then we went Christmas light spotting which was hilarious ! On Christmas Eve, My mam and I got our hair done in the hairdressers and myself and Mai/Lucy Santa tracked Santa. I had a lovely Christmas Day with my family but I preferred the build up to the Day itself. 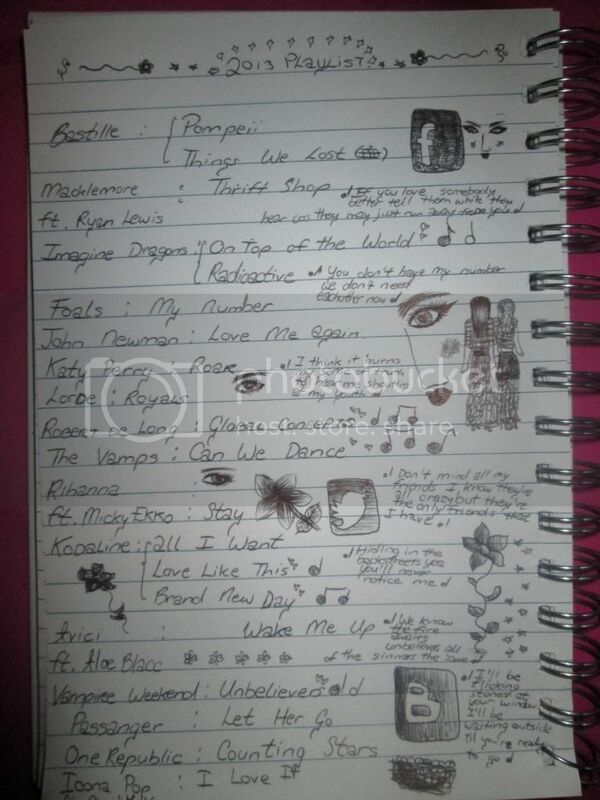 And for my 2013 playlist ! Thank you so much for reading Dainty Sprinkles during 2013 - Whether you only began reading it today or you've been reading all year or even before that ! I can't even find the words to describe how happy blogging and YouTube makes me and the fact people enjoy my fashion and makeup rambles makes me even happier so thank you ! It definitely sounds like you had a wonderful year. Here is hoping the next year is just as great!